As you probably know, I love lip balm so when Almay recently released their new Color + Care Liquid Lip Balm, I had to try it. Almay Color + Care Liquid Lip Balm is a lightweight balm-gloss that adds a soft wash of colour to your lips while providing comforting hydration. This balm is packaged in a standard lip gloss tube, there is 7.1 ml, 0.24 fl Oz. of product. I paid $5.99 for this at my local CVS. Prices may vary somewhat, depending on where you live and from what store you purchase this product. Keep an eye out for coupons. I often see Almay coupons in my coupon books in my Sunday paper. The applicator is a standard foam doe foot applicator on a wand. The liquid lip balm is the consistency of a lightweight lip gloss, it is lightly pigmented and it has a very light, slightly plastic-y artificial vanilla scent that doesn't last much longer than it takes to apply the product to your lips. I bought the shade Blooming; a light, cool pink. There is a good sized selection of colours in this product, everyone should find something that they like and will flatter them. There is no shimmer or sparkle in this liquid lip balm. 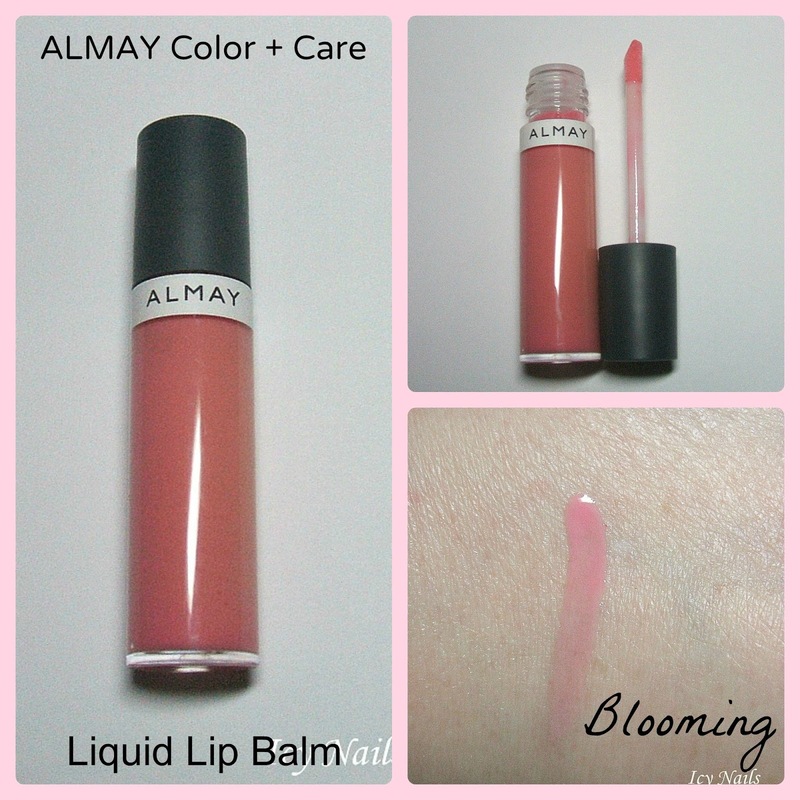 Almay Color + Care Liquid Lip Balm in Blooming is a very nice lip balm. It is silky and light on my lips, the finish is glossy and shiny, tho on my pigmented lips the pink doesn't really show up. This just reads as a milky gloss on me. I don't care. Where this product really shines is in the care part of the Color + Care. This liquid lip balm is very hydrating, it keeps my lips feeling soft, smooth and comfortable all day long. My lips don't get dry toward the end of the day and I don't get that annoying, painful red ring of chap around the edges of my lips as I can with some glosses or lip balms. My only complaint? It seems to go fast. I have only had my tube a few weeks and it is already running seriously low. That could be partly my fault... I am a notorious reapplyer. That won't stop me from buying this again. And again. I am a fan of this stuff and I want to try other colours as well as getting a backup or two of Blooming. Have you tried the Almay Color + Care Liquid Lip Balm? What shade did you get? Do you like it? Not so much? Please do tell, I'd love to hear what you think. Thank you so much for popping in and reading. Have a great day! Enabler. Have you seen my lipgloss drawer? I really don't need more. But I need to try them. :) Great review, thanks!! I have three of these- Cantaloupe Cream, Apple A Day, and Nudetrients. Nudetrients is a silly name but I like the colour enough. The apple one leaves a stain if you like that kind of thing (I do) but application can be a little trickier because of it. I have a feeling that I'll wind up with another colour or two as soon as I get another coupon deal. These things are kind of addicting. Good review and pics! Blooming is a pretty colour.